Testifying that the foundation of modern Western thought, theory, and practice can be traced back to ancient African thought, theory, and practice, Intellectual Warfare exposes the African influence on Greek and Roman thought and its influence on the development of modern Western society. It then establishes the urgency to defend and honor the role of Ancient African civilizations on this major event. Exposing fallacies and reestablishing new and undistorted ways of viewing the formation of Western society, Intellectual Warfare shows how classic literature shaped the contemporary world in intricate and sometimes startlingly and brutally honest detail. Not satisfied with simply challenging the reader to think about things differently, the volume goes further, citing specific examples and offering instruction on how to begin to retrain oneself to think about the origins of modern society in other terms. The book is also separated from other such critical efforts by expanding the text with instruction for implementing new ways of looking at the educational curriculum–to ensure that the task of improving education can be taken up by future generations. This book is more than just a critical examination of the war to revitalize the African Worldview for the survival of people of African descent. 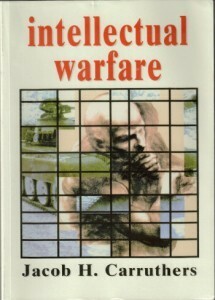 Intellectual Warfare offers insight and instructional methods to assist those individuals ready to make African-centeredness a part of their lives; thereby choosing their own position in the battle to defend the African Worldview. By invoking the works of great teachers of our past, Intellectual Warfare leads us back home to our “Black” selves, our ideas, and our spirituality.